Why do I not get a green tick using the Target Setup utility? The Target Setup utility is used before calibration and tests and in most cases gives confidence the target is set up correctly and the following calibration will provide accurate and reliable results. Target Setup does have limitations and knowing these will help to understand why sometimes you won’t get the green tick even though everything is actually set up correctly. 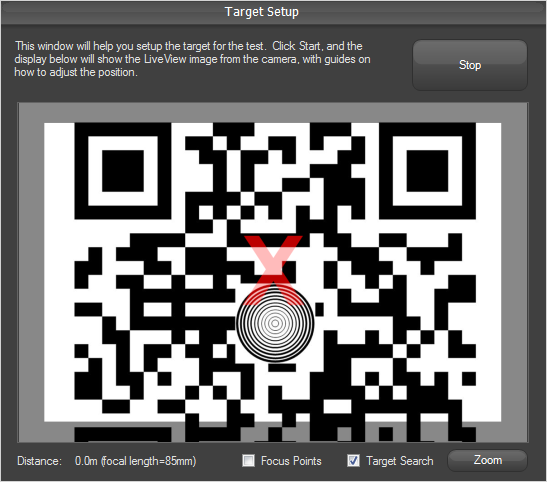 In order for the Target Setup utility to work (and other features that use Target Detection, for example the Target Validation and Target Optimisation options) the image captured from the camera must contain the complete black-and-white coded area of the target within the detection area of the utility window (within 90% of width and height of the image). The grey guide around the edge of the LiveView images shows the extent to which the target can be detected. If the whole coded area is clear of the outer guides, it will still be detected as shown in this image. The icon in the centre of the window shows which way to move the camera to correct the setup and get the green tick. Again, this target is detected as the coded area is completely within the central section. 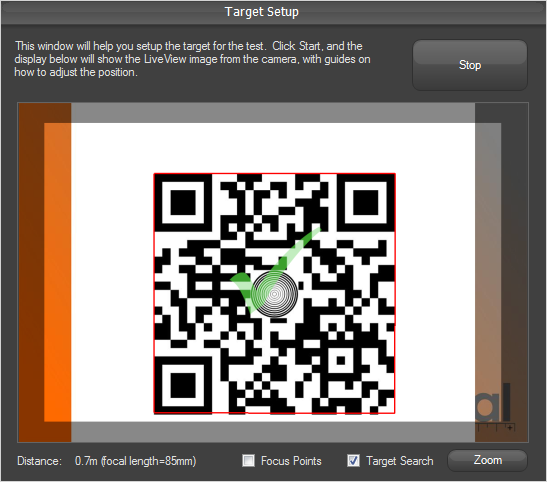 If the target is shown at a good size and is recognised, users should NOT press the “Zoom” button. Pressing “Zoom” may cause part of the target to fall outside the detection area and the target no longer detected. In this instance, the red “X” is shown as the target cannot be decoded by the software as the target fills too much of the liveview window. In cases where the target is shown very large and the edges are outside of the screen you will have to make your own judgement as to whether the target is in the correct position. This generally won’t happen unless the target is printed very large or you are calibrating a macro lens close up. 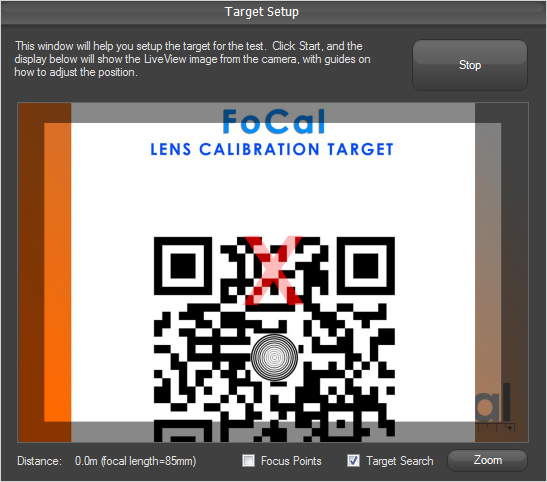 If the target is parallel to the camera sensor and straight in front of the camera lens then your calibration will be accurate and successful. Although this target is a good size, the coded area crosses the guides and is not completely within the detection region and cannot be detected. In this case moving the camera downwards slightly will allow the target to be recognised (and the green tick will be displayed). Finally, if the target is too small in the image it will not be detected. 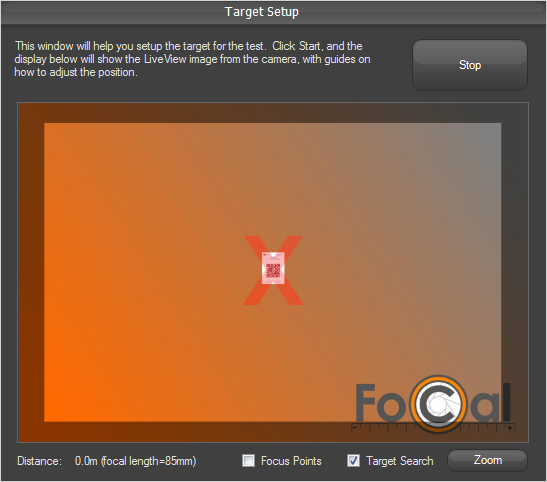 In this case you can press the “Zoom” button, this magnifies the area and allows FoCal to recognise the target. The distance for the target should be based on the minimum recommended distance, as given by Target Distance Tool if you’re much further away than this you could move closer. 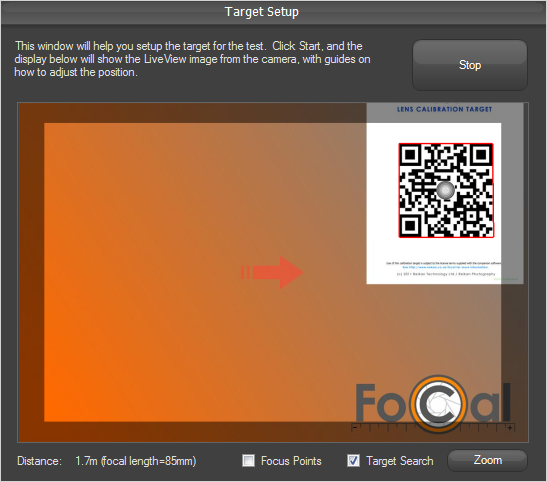 You can also print the target larger and that would allow FoCal to more easily ‘see’ it within the liveview image, in most cases using the zoom button will help.